Karen A. Heidelberg, M.D. is a board certified Dermatologist. She received her medical degree from the Howard University College of Medicine, and completed her internship in internal medicine at George Washington University Hospital. And while completing her Dermatology residency at the Mayo Clinic in Rochester, MN, she received recognition for excellence in patient care. It was a professional goal, once she completed her training, to return to the city where she was born and raised to practice along side her father, Dr. Robert P. Heidelberg. She realized that goal in 1997, and is now the president of Heidelberg Dermatology. The Detroit-based practice was established by her father in 1971, and has been dedicated to providing excellent dermatologic care for over 40 years. Heidelberg Dermatology is nationally renowned, with distinguished recognition for providing excellent patient care and their management of complex dermatologic issues. In addition to her practice, she is a faculty member of the St. Joseph Mercy Hospital Dermatologic residency, where she trains residents. She is also sought after to teach both residents and medical students affiliated with other institutions, and has been honored with several teaching awards. 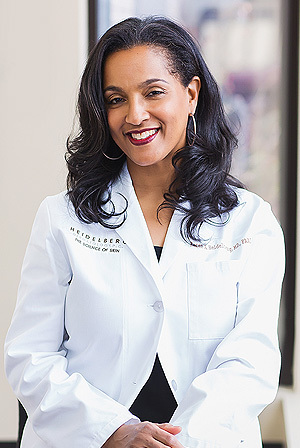 Dr. Heidelberg is a member of the National Medical Association, the American Medical Society, Michigan State Medical Society, Detroit Medical Society, the American Academy of Dermatology, Michigan Dermatologic Society, and the Women’s Dermatologic Society. She has served on several committees of the American Academy of Dermatology, and currently serves on several boards. Active in her community, Dr. Heidelberg serves as an elder of her church, a committee chair of Jack & Jill of America, and is a member of Delta Sigma Theta, Inc. and Links, Inc.
Dr. Heidelberg resides in Detroit, MI with her husband, John Barnwell, M.D., and has two children.